There is one simple trick that can greatly improve your crochet and your crochet experience, networking. Networking can greatly help in a professional manner for those interested in following a career in crochet, but in its simplest form it can help you improve your crochet skills. Sharing our passion with ours is an opportunity to learn and grow, finding other crocheters allows you to gain new insights to methods and approaches that you have not thought of before. Finding networking opportunities vary dependent upon where you live, you can seek out local crochet guilds (from CGOA), or even local get-togethers(from Ravely), or even gatherings at local coffee shops, community or senior centers, libraries, and local yarn shops. Even finding a few “crochet friends” can improve your skills and bring new joy to your work. If you are a crochet professional or aspire to be, then networking with follow professionals can greatly assist you in your profession. You can never be a expert at all the skills you need to make your business grow, but by networking you can find the people and the tools that can help you. 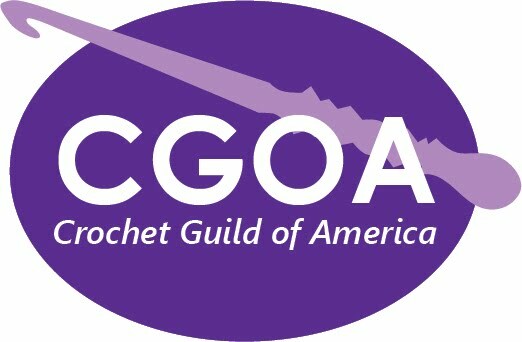 For 2014 there is one event in the United States that can aide both professionals and non-professionals in obtaining networking opportunities, the CGOA 20thAnniversary Chain Link at the Knit & Crochet Show, in Manchester, NH July23-27. There are opportunities for all to get together and make the connections that can last a life time. Pre-Registration ends June 30, so if you haven’t already, make your plans to attend, it could just change your life (This I speak to as a personal experience). The entry form for the 2014 Design Competition is now live. Please have your membership information ready, as you must sign in before viewing the form. Please wait to submit a form until your design is ready to ship, in case you change anything; the entry information should exactly match what's inside the package. Best of luck! Hope to see you at the July conference in Manchester for the announcement of the winning designs.